How to run a 10k in two Months worth of safe training. How to run a 10k in two Months. 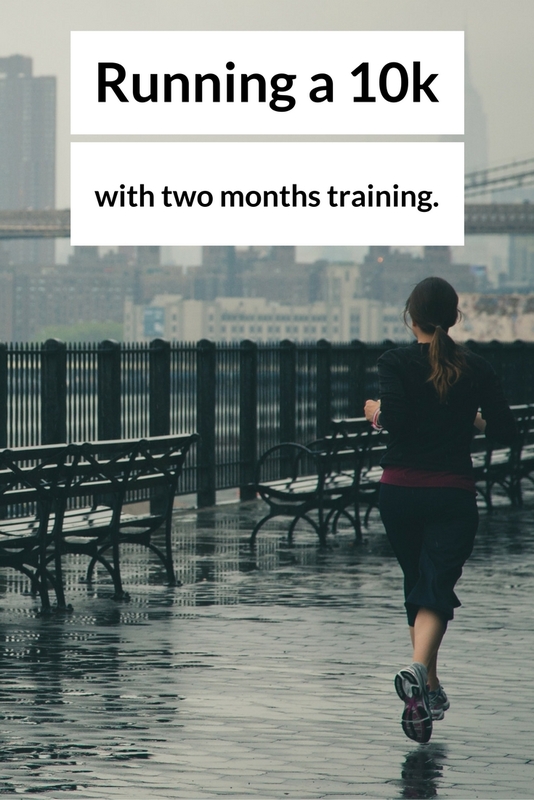 How can you run a 10k in two months? Train smart. It is possible to run a 10k in two months if you listen to your body and follow your training plan closely. There are a few other things you need to keep in mind when you want to quickly increase your mileage for an upcoming race. You should only take on such an ambitious task if you have run in the past or you already have a high level of fitness. It’s unrealistic to think you can go from a couch potato to a 10k race in just two months. If you have ran a 5k before, jumping to a 10k will be no problem for you. Take your rest days seriously. On your rest days you need to REST. Your muscles need time to recuperate after your runs. Don’t over-do it. Follow your plan and only run on ‘run days’. If you push yourself too far, it will only lead to injury. Strength train. This is very important! Not only will it help you stay injury-free, but it will also help you become a better runner by building muscles in your legs. Watch what you eat. You need to stick to a healthy diet for best results. You need to give your body what it needs to perform at it’s best. Don’t expect too much. If you haven’t done enough training, don’t expect to be at the front of the pack. Set a realistic time goal for yourself if this is your first 10k. Have fun and don’t take it too seriously. There will be lots of races to come. Have fun with your first 10k and train hard for the next one! The big take away here is be safe. If you are training and eating smart you are bound to be successful!